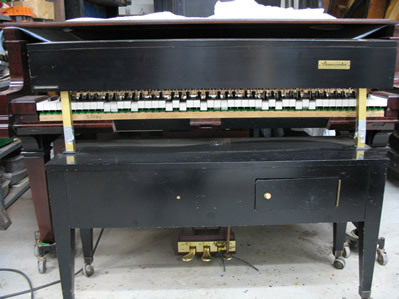 In the weeks prior to final delivery, Bob arranged for the newly restored piano (East Coast Piano Rebuilding) and the restored player mechanism (The Hunt Piano Company) to go through a "break-in" period. 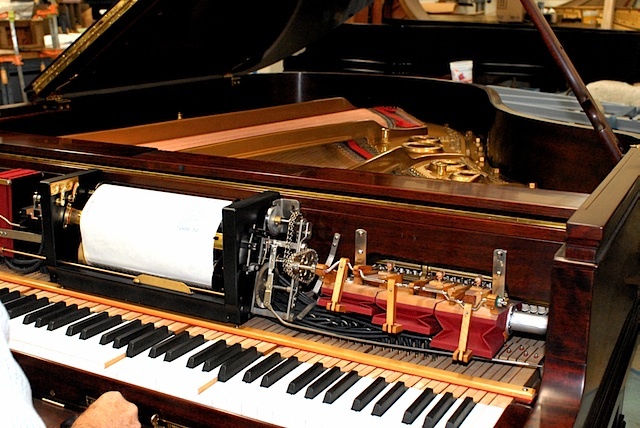 The piano was played first by a Vorcetzer (see below) and then played by the VirtualRoll. The break-in period allows the piano and the reproducing mechanism to settle in and regulation, tuning, voicing can be fine-tuned. Click here (a link to an .mp3 file) to listen to the Vorcetzer above playing a Mason & Hamlin piano. Click here and here for additional recordings of the same Mason & Hamlin being played by the Vorcetzer. As the restoration project neared completion, I was invited to visit East Coast Piano Rebuilding to see my grand piano completely restored and the VirtualRoll in action. Here is a photo of the piano as I saw it for the first time being played by the VirtualRoll. Hear the VirtualRoll playing this piano!